JAMES EARL CARTER, JR. was born in Plains, Georgia on October 1, 1924. He was the eldest of the four children of James Earl Carter and Lillian Gordy Carter. His father was a peanut farmer and operated a small country store in the tiny farming community of 600 people and his mother was a nurse. Carter attended the local schools in Plains and graduated from Plains High School in 1941. He enrolled in Georgia Southwestern College, being the first member of his family ever to go to college. After a year, he enrolled in the Georgia Institute of Technology. As a boy, Carter received postcards of exotic ports sent by his uncle who was in the Navy, and he dreamed of attending the Naval Academy in Annapolis Maryland. His dream came true when he received an appointment through his local congressman. He graduated 59th in a class of 820 in 1946. On July 7, 1946, Carter married Eleanor Rosalynn Smith, a girl he had know since high school who was his sister Ruth’s classmate and friend. The two had started dating the previous summer when Carter was home on leave from the Naval Academy. The couple had four children: John William (Jack) born July 3, 1947 in Portsmouth, Virginia; James Earl III (Chip) born April 12, 1950 in Honolulu, Hawaii; Donnel Jeffrey (Jeff) born August 18, 1952 in New London, Connecticut; and Amy Lynn born October 19, 1967 in Plains, Georgia. Carter’s naval career began with service on battleships, and after two years he was accepted for submarine duty. He was assigned to the nuclear submarine Sea Wolf and later worked for Admiral Hyman Rickover, who made a lasting impression on Carter, on a nuclear engineering project. In 1952 Carter enrolled at Union College in Schenectady, New York, studying nuclear physics. In 1953 at the death of his father, Carter resigned from the Navy and the family moved back to Plains, Georgia, to run the family business. They lived in public housing for the first year, with Carter running the business and his wife doing the bookkeeping. 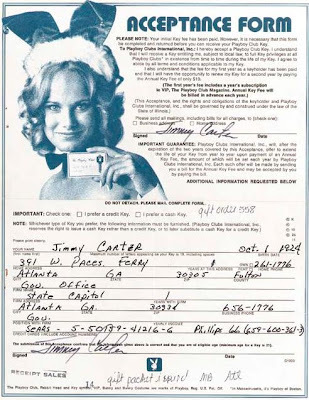 The first couple years were not easy but Carter became successful, starting a fertilizer business, a farm-supply operation, increasing his landholdings and acquiring a cotton gin and a peanut shelling plant. Carter’s political career began as he was establishing himself as a businessman. His father had always been politically active and in 1960 Carter won his first elective office, a seat on the local school board. When a new state senatorial district was created in the area during the legislative reapportionment of 1962, Carter decided to run for the seat. At first, it was believed that Carter had lost, but he proved that his opponent in the primary had broken voting laws by blatantly stuffing the ballot box. The resulting legal battle brought him victory in the primary and in the general election. He served two terms in the state senate and in 1966, he ran for the Democratic nomination for governor of Georgia. He came in third, but immediately began to prepare for the 1970 campaign. He defeated former governor Carl Sanders in the primary and was elected governor in the November general election. Among the new young southern governors, he attracted attention by emphasizing ecology, efficiency in government, and the removal of racial barriers. Carter was not eligible for a second term as governor, so about halfway through his four-year term, he decided he would seek the presidency of the United States. He began an exhausting schedule of campaigning as soon as his term ended, sensing the mood of the country was anti-Washington and the people were interested in an outsider who was untainted by the insider politics of the Nixon era. 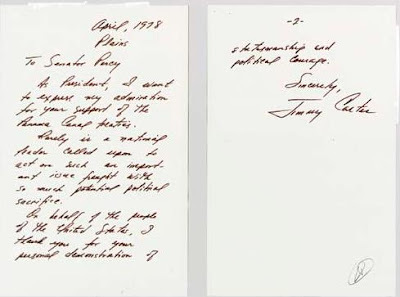 Carter promised to restore honesty and morality to the federal government. He gained credibility with early primary victories and received immediate attention from the press. He won the nomination on the first ballot of the Democratic National Convention in New York and chose Senator Walter Mondale of Minnesota as his running mate. Carter achieved a narrow victory in the November, 1976 general elections by sweeping most of the South, winning 297 electoral votes to incumbent Gerald R. Ford’s 241 and 40.8 million popular votes to Ford’s 39.1 million. Carter was inaugurated on January 20, 1977, and after taking the oath of office, he and his family walked to the White House. One of Carter’s first acts as President was to pardon the Vietnam draft dodgers. He decreased the federal budget deficit, deregulated domestic oil prices and formed a Department of Energy. He improved bureaucratic efficiency and placed many women and racial minorities in senior government jobs. His expansion of the national park system included protection of 103 million acres of Alaskan lands. To increase human and social services, he created the Department of Education, bolstered the Social Security system, and appointed record numbers of women, blacks, and Hispanics to Government jobs. In foreign affairs, Carter set his own style. His championing of human rights was coldly received by the Soviet Union and some other nations. 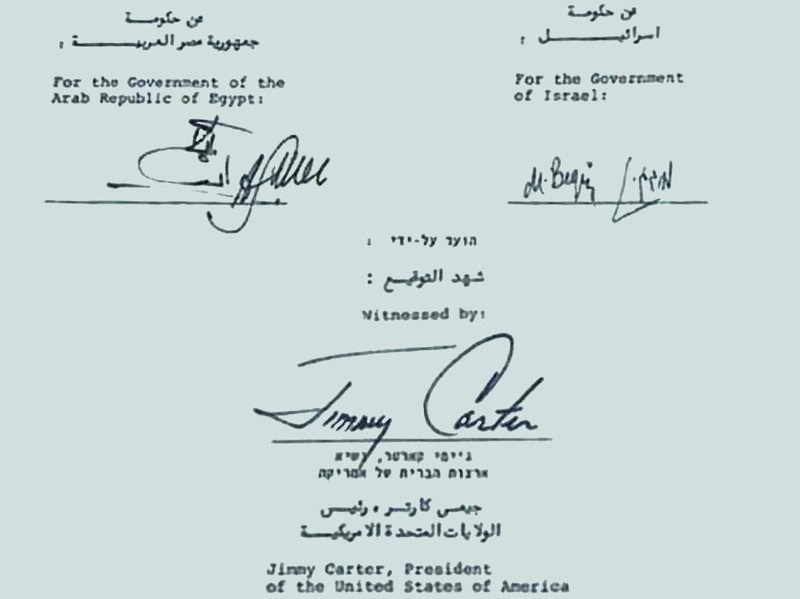 In the Middle East, through the Camp David agreement of 1978, he helped bring amity between Egypt and Israel. Building upon the work of predecessors, he established full diplomatic relations with the People's Republic of China and completed negotiation of the SALT II nuclear limitation treaty with the Soviet Union. There were serious setbacks, however. The Soviet invasion of Afghanistan caused the suspension of plans for ratification of the SALT II pact. 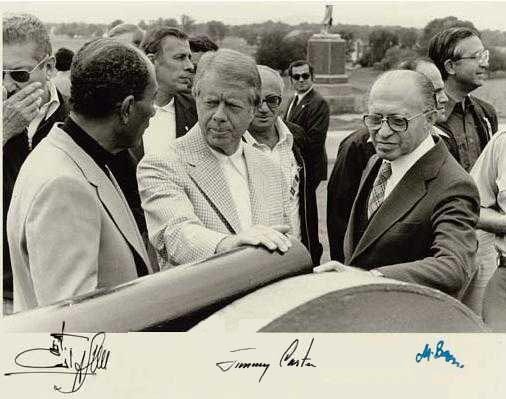 CAMP DAVID ACCORDS photograph signed - Jimmy Carter recalls: " Midway through the final week of the Camp David peace talks, everyone needed a break. We went to the Civil War battlefield at Gettysburg one day and I made them both agree not to talk about the Middle East or about anything that happened since 1865. I sat between the two men in the limousine. We got to Gettysburg, and Sadat, all of his generals, and all of the Israeli generals knew the battle details - I was really amazed. However, Menachem Begin did not know anything about the battle. We had Shelby Foote with us, an expert on the Civil War. And so Begin was a little embarrassing to me, not having learned about Gettysburg. But when we arrived at the point where Abraham Lincoln had made his address, Menachem Begin recited it word-for-word. A nice event - that I will never forget." - Jimmy Carter 1998 remarks, University of Maryland symposium. 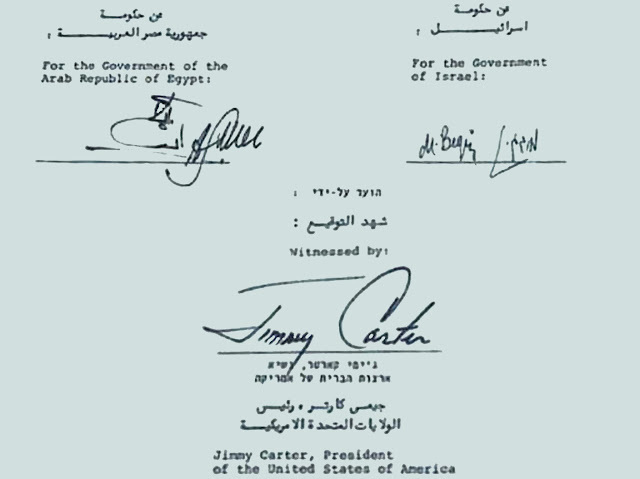 Carter faced his greatest major foreign policy challenge in 1979. That January, Mohammad Reza Shah Pahlavi, who had ruled Iran for 37 years, was forced to flee the country in a takeover by followers of Ayatollah Ruhollah Khomeini, a Muslim clergyman. In November 1979, militant Iranian students stormed the U. S. embassy in Tehran, the capital of Iran. They took 66 Americans hostage. They soon released 13, but demanded a U.S. apology by the U.S. government for its support of the shah, his return to stand trial and the return of the billions of dollars he was said to have been hiding, before they would release the other 53 hostages. More than a year of negotiations with the militants did not secure their release, nor did a U.S. commando raid the following April. He had inherited an economy that was slowly emerging from a recession and he had severely criticized former President Ford for his failures to control inflation and relieve unemployment. His relationship with the Congress, which was controlled by the Democrats, was often very strained. On another international relations matter Carter succeeded in obtaining ratification of the Panama Canal treaties. Despite vehement opposition in Washington to relinquishing control of the canal, Carter insisted that a new agreement must be reached: "Our failure to take action after years of promises under five previous Presidents had created something of a diplomatic cancer, which was poisoning our relations with Panama" (Carter, Keeping Faith, p. 159). A new treaty providing for the return of the Canal Zone to Panama encountered staunch opposition in the Senate. The battle for ratification, Carter later wrote, constituted "the most difficult political battle I had ever faced." Ultimately, the Senate ratified the treaty with 64 votes, one more than the necessary two thirds. In this letter President Carter thanks Senator Charles H. Percy for his vote on the Panama Canal: "As President, I want to express my admiration for your support of the Panama Canal treaties. Rarely is a national leader called upon to act on such an important issue fraught with so much potential political sacrifice. On behalf of the people of the United States, I thank you for your personal demonstration of statesmanship and political courage." Carter, in 1980, could claim an increase of nearly eight million jobs and a decrease in the budget deficit, measured in percentage of the gross national product. Unfortunately, inflation and interest rates were at near record highs, and efforts to reduce them caused a short recession. The 1980 presidential campaign was overshadowed by the Iranian hostage situation and by Carter’s inability to secure their release. The ensuing presidential campaign was one of the most uninspiring in modern history. Carter’s opponent, California Governor Ronald Reagan was swept into office with a landslide victory with 51% of the popular vote to Carter’s 42%. Ironically, Carter’s last major official action was to secure the release of the 53 American hostages in Iran. They were freed on January 20, 1981, the day of Ronald Reagan’s inauguration. Carter returned to his home in Plains, Georgia. He continues to remain active in human rights issues and has become the public spokesperson for numerous charitable causes, including Habitat for Humanity, which helps build low-income housing. He has written more than eleven books and teaches Sunday School and is a deacon in the Marantha Baptist Church of Plains, Georgia. In this outward and physical ceremony, we attest once again to the inner and spiritual strength of our Nation. As my high school teacher, Miss Julia Coleman, used to say, "We must adjust to changing times and still hold to unchanging principles." Here before me is the Bible used in the inauguration of our first President, in 1789, and I have just taken the oath of office on the Bible my mother gave me just a few years ago, opened to a timeless admonition from the ancient prophet Micah: "He hath showed thee, O man, what is good; and what doth the Lord require of thee, but to do justly, and to love mercy, and to walk humbly with thy God." 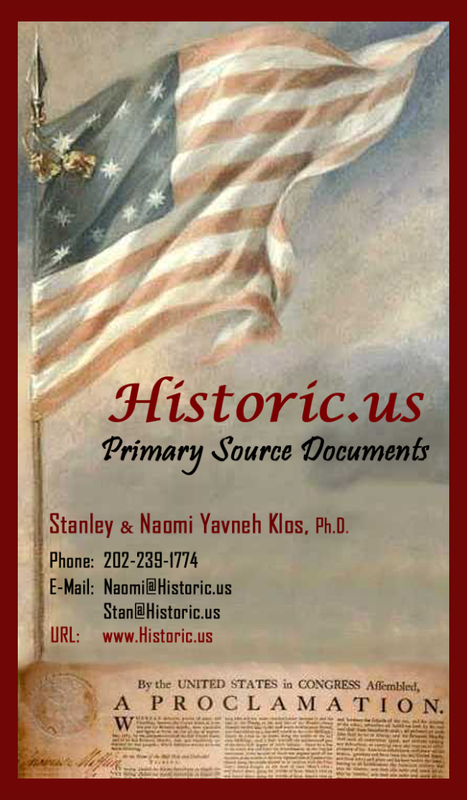 Two centuries ago, our Nation's birth was a milestone in the long quest for freedom. But the bold and brilliant dream which excited the founders of this Nation still awaits its consummation. I have no new dream to set forth today, but rather urge a fresh faith in the old dream. Ours was the first society openly to define itself in terms of both spirituality and human liberty. It is that unique self-definition which has given us an exceptional appeal, but it also imposes on us a special obligation to take on those moral duties which, when assumed, seem invariably to be in our own best interests. We have already found a high degree of personal liberty, and we are now struggling to enhance equality of opportunity. Our commitment to human rights must be absolute, our laws fair, our national beauty preserved; the powerful must not persecute the weak, and human dignity must be enhanced. We have learned that more is not necessarily better, that even our great Nation has its recognized limits, and that we can neither answer all questions nor solve all problems. We cannot afford to do everything, nor can we afford to lack boldness as we meet the future. So, together, in a spirit of individual sacrifice for the common good, we must simply do our best. The world itself is now dominated by a new spirit. Peoples more numerous and more politically aware are craving, and now demanding, their place in the sun--not just for the benefit of their own physical condition, but for basic human rights. We are a strong nation, and we will maintain strength so sufficient that it need not be proven in combat--a quiet strength based not merely on the size of an arsenal but on the nobility of ideas. We will be ever vigilant and never vulnerable, and we will fight our wars against poverty, ignorance, and injustice, for those are the enemies against which our forces can be honorably marshaled. We are a proudly idealistic nation, but let no one confuse our idealism with weakness. Because we are free, we can never be indifferent to the fate of freedom elsewhere. Our moral sense dictates a clear-cut preference for those societies which share with us an abiding respect for individual human rights. We do not seek to intimidate, but it is clear that a world which others can dominate with impunity would be inhospitable to decency and a threat to the well-being of all people. The world is still engaged in a massive armaments race designed to ensure continuing equivalent strength among potential adversaries. We pledge perseverance and wisdom in our efforts to limit the world's armaments to those necessary for each nation's own domestic safety. And we will move this year a step toward our ultimate goal--the elimination of all nuclear weapons from this Earth. We urge all other people to join us, for success can mean life instead of death. --that we had enabled our people to be proud of their own Government once again. These are not just my goals---and they will not be my accomplishments-but the affirmation of our Nation's continuing moral strength and our belief in an undiminished, ever-expanding American dream.